Unique Melody has been extremely proactive in the last 12-18 months with a re-tuned version of just about every CIEM in their lineup including new editions such as the ME.1 The recently announced Mason V3, priced at $2699, is part of a big dual combo launch which also includes the new 12-driver $2099 Mentor V3. Just to clarify, both Maestro and Mason are in fact the same, just named for different markets. The Mason name has remained whilst the Maestro name has been retired. We reviewed the Maestro V2 last year so we are glad to be able to compare the 2nd gen and 3rd gen in this review. However, this is not just a simple update. No sir, there is a heck of a lot of new technology with the Mason V3 that I consider to be, well, rather unique. The Mason V3 is a 16 BA driver monitor which can be bought either in universal or custom format. There will be a price difference between the two variants but suffice to say the price point makes this Unique Melody’s flagship monitor. The BA design is a 4-way, 5-bore design with 4 sound tubes and 1 bore designed for their new DB-GO tuning module. The BA groupings are 4 for the Lows, 4 Lower Midrange, 4 Upper Midrange and 4 for the highs. The Mason V3 was launched at the same time as the Mentor V3. The Mentor V3 is a 12 BA driver variant and having heard both I can tell you that both will appeal to different audiences in their tuning. The Mason V3 is pitched more as a ‘reference’ flagship with an eye for detail whereas the Mentor V2 is going more for musicality and a slightly more fun presentation. This is a huge pitch for me. If you are a cable believer then this is some sort of impossible wishlist achieved. Even if you are not here is an AB blind test that you can try out for yourself. The Mason V3 comes fully loaded with a cable offering two flavors of sound; 6N OCC copper and 6N OCC silver. All of this is wrapped into one jack with a specially constructed connector that simply requires swapping around to change the cable and tone. No, this is not a hybrid cable. It is actually 2 unique cables but handles like one. Fabulous, brave and something I hope they expand on in the coming months. The pitching keeps on rolling with their new optional Dreamweaver shell design. Traditionally CIEMs come in two flavors, acrylic and silicone. Technically UM has gone with acrylic, however, this is a ‘layer by layer’ handmade design which they claim will make the shells much stronger than traditional acrylic shells. Not only that but you can also choose a new range of shells that change color depending on the ambient temperature. Go above 31c and you have one color, go below, and you have another. The final pitch, consistent with what I consider to be UM’s “choice” theme, is that of a tuning module. Now, this is nothing new but it is a first for Unique Melody. 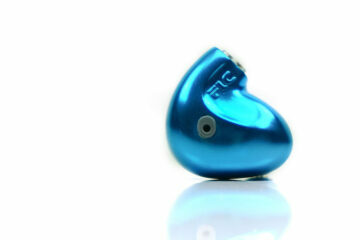 We have seen the pure acoustic filter on the ME.1 which I am a big fan off for hearing damage prevention. The DB-Go Bass enhancement module is not quite that but it does have attenuation properties that do relieve pressure. Its main pitch is a 4dB plus or minus of the sub-to mid bass frequency giving the listener a little hint of warmth and power when needed. Well almost. They do have a new website and it is a website that you can tweak and customize your monitor and then buy it but it is currently only the Chinese version. After all, UM is a Chinese company. Fear not, an English version will be coming very soon, I am told. My own personal process was a communication via chat and email with the lab and it turned out rather well. However, for any regular buyer, the website is going to provide the platform to make those key decisions. Currently, the customization process is open for the Mentor and Mason series though eventually, all will be available. The website design tool is pretty much on the same level as Vision Ears, Custom Art in terms of workflow but there is no e-check out. You print off the form and email it to UM as far as I can tell when complete. Without the benefit of an English version, I cannot say how close to complete the tool is but there are certainly a ton of options. Just not the very latest options. If you need an electronic check out service and are based in the US then Musicteck has a more powerful e-system to pay online but you cannot see images of your CIEM being built as you select the finish. The UM website process begins with accessing the store which will take you right through all the options including accessories and cable terminations. You will also have a price accumulator to the bottom right, so you can see how much everything will cost as you go along. Even with little or no Simplified Chinese, I could probably take a decent stab at creating a good custom monitor. 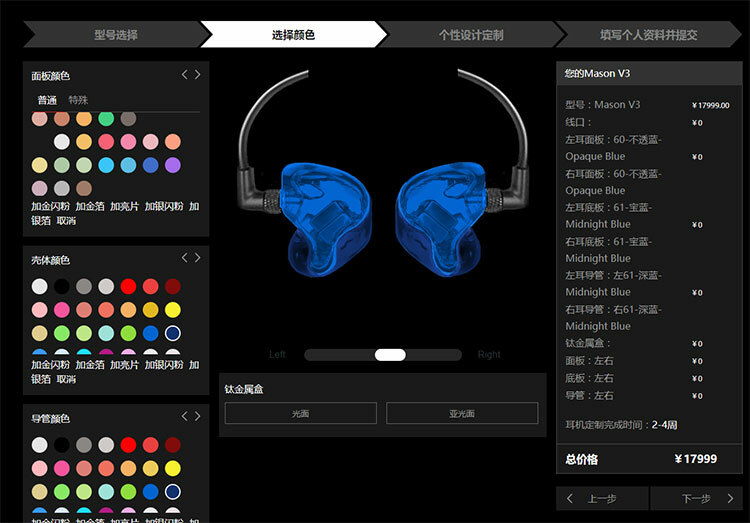 You can customize each individual earpiece (left or right) in terms of shell and faceplate. You can also put your own custom artwork and text onto your creation. Should you accidentally hit the back button it will retain all your choices as well so you do not have to start again. The Mason V3 starts at $2699 for the base unit and I am told that the price will remain fixed at $2699 regardless of plate or shell chosen. That is one heck of a value deal. Now some companies have really fair pricing for options, some slightly more expensive but this is a first in my experience where it is $0 for additional. At the initial page, you are asked to choose your cable termination which is a slightly odd offering to begin with. Cable terminations include 3.5mm and balanced via 2.5mm and 4.4mm. You should also choose whether you wish to buy the Mason or Mentor at this stage. The second stage is the key stage. 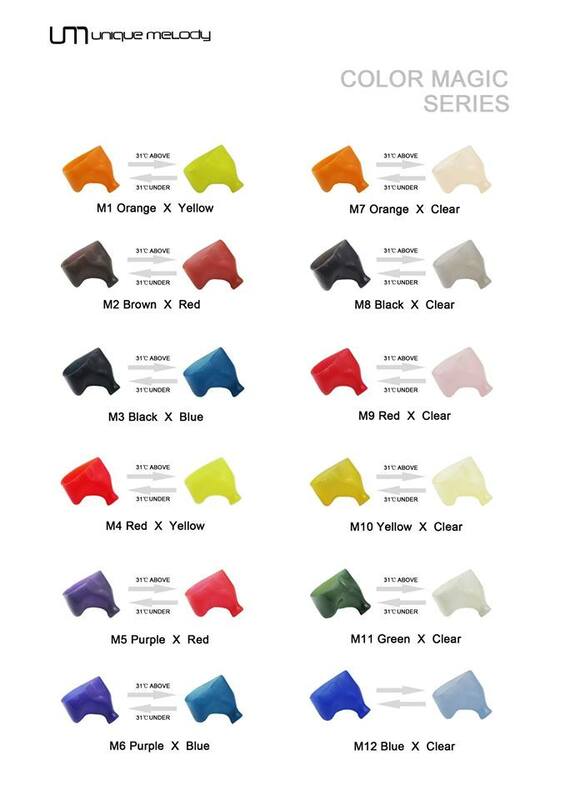 Here you can start customizing the type of color you want on your shell and faceplate. You can do both shells at the same time or you can split left and right. As I count there currently seems to be 48 color schemes and you can individually customize the plate, shell, and nozzle with any of the colors available. The final two stages cover the uploading and implementation of any custom artwork you wish to use as well as names of the owner and final requests before order completion. Here you can also choose UM logos. You can choose the same for both shells or different ones for each shell. At the time of writing though I am unable to see the new Dreamweaver, changing color schemes and premium plates. Hopefully, that will be available soon when the international version of the site is complete. For a current guide on some of the luxury plate options and if you are based in the US you can check out MusicTeck’s helpful quick builder which has 10 faceplate designs. These include a choice of differing wood finishes as well as carbon fiber, titanium and gold faceplates. In the meantime below are the new options you can choose for your changing color shell choices of which there are 12 in total. There are no translucent choices, it wouldn’t be possible for colors to change using that type of material so they are all solid in color. 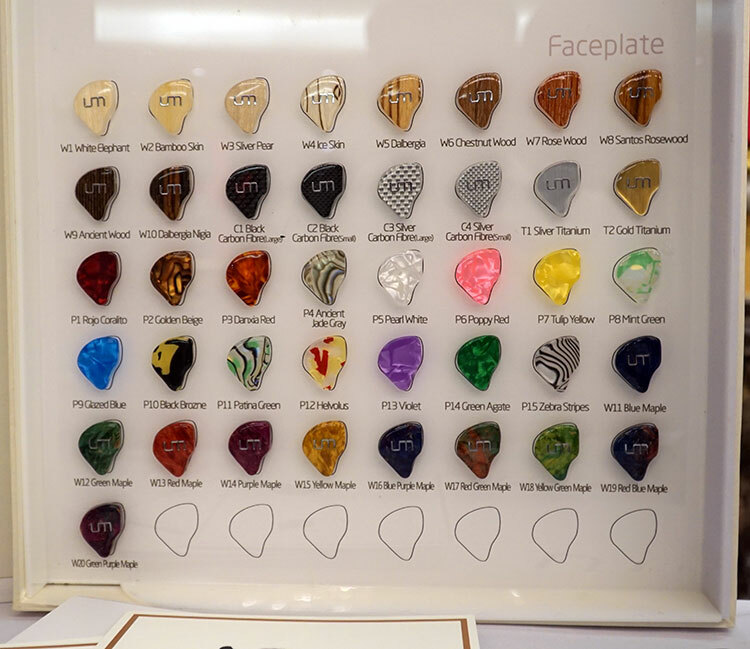 I did, quite luckily, grab a snapshot of the UM booth at the Guangzhou Audio Show on Nov 4th so I can show you the new faceplate options available. Again, when the international site is ready I hope to see them on the designer tool as some are Dreamweaver compatible. Should you need your Mason V3 right now I advise shooting an email to MusicTeck or UM direct and asking for them. My own choice was the W16 Blue Purple Maple along with a silica blue shell using the Dreamweaver build. Logos and names can be added to the final section of the online design tool currently available. I preferred the simple ‘UM’ logo in silver. My own personal opinion is that the store is not quite ready yet but the engine is in place. It just needs an English version and the new faceplate/designs uploaded. Thereafter it should be an excellent device to fully automate the buying process for your new Mason V3. UM have come a long way in terms of packaging. 2011 was huge but not transportable. 2016 was cube-like, very transportable and a big step up. 2017 sees a continuation of that metro minimalist style only with a few additional layers of presentation and some handy additional items. The box is a bit longer and more traditional in design than the tiny cubes of 2016. I did love those cubes but the presentation on the Mason V3 does feel a little premium especially when you lift the lid. Inside the presentation is much more pristine with better spacing and multi-layered. On the top level, you have the small screw top metal carry case with the warranty card on the opposite side. The screw case is actually made out of titanium rather than the usual aluminum. Two reasons for that. One it is sturdier and two its silent when screwing and unscrewing, unlike the aluminum version. 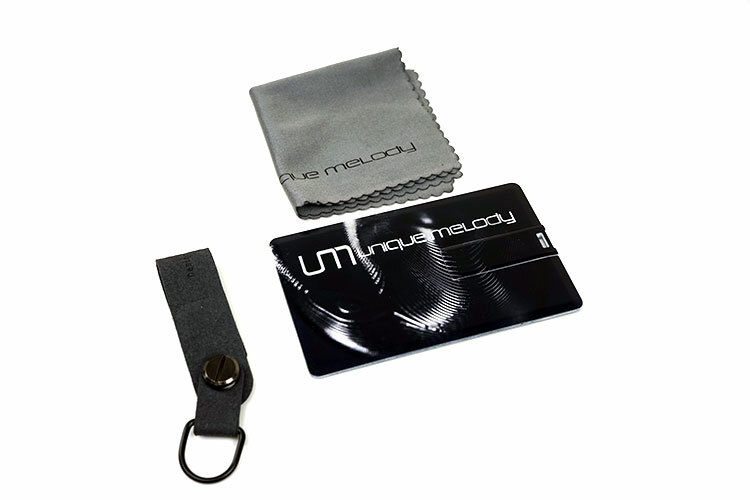 Underneath you receive a cleaning cloth and a handy MEC (magnetic earphone clip) cable organizer strap which doubles up a shirt clip. The new strap is pretty nice actually as it is not a click button but a soft suede strap with a magnet underneath so it just snaps together real easy. Subtle but useful stuff like this titillates me. What could have been added? Well, a few microwaveable silica drying pellets would be useful as well as a cleaning pick for cleaning the Mason V2 tubes. I realize I am an ‘early adaptor’ so I do hope these will show up once they officially start shipping. UM include an online ear impressions guide in their FAQ section. You will find all the necessary information including the type of clay to use, how deep the impression should be as well as shipping instructions. Note that UM do not require open jaw impressions so no need for a bite block when you go to your usual audiologist. Just keep your jaw steady but relaxed prevent the clay impressions from poorly curing. A full ear impression to the second bend in your ear canal is always required. 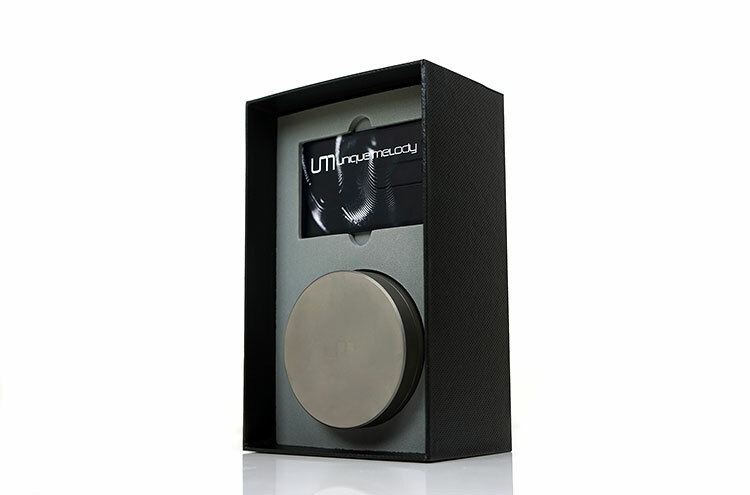 Then it is a simple case of packing them securely and sending them to UM or your distributor via your favored courier. Its a bit more subtle than most but a good effect. That tuning module is cool!